Fancy making dolma but don't think you can handle rolling vine leaves? 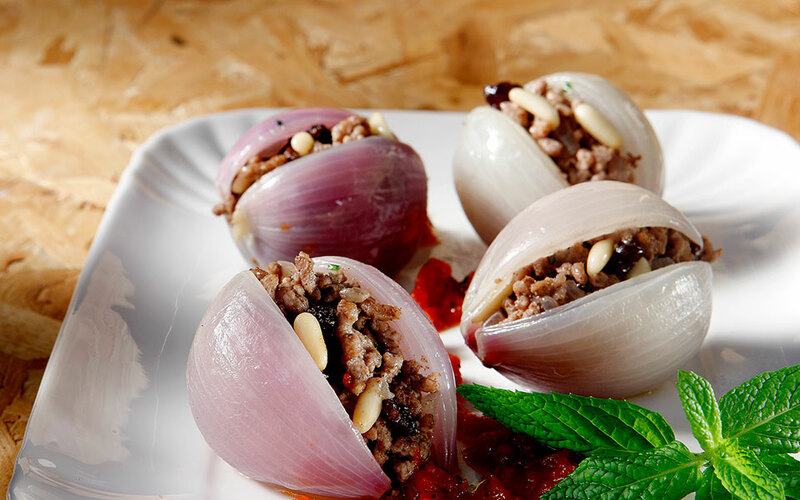 Stuff onions instead and impress your friends with this tasty dish. For the onions: Cut away any roots and remove the first layers of the onion. Then slice the onion down one side, almost to the heart, so as to have as many big petals as possible. Separate the bigger, stuffable shells and dice the heart and smaller petals for the stuffing. In a saucepan big enough to accommodate a dinner plate, simmer the stuffable onion petals, along with the sugar, 100ml of the vinegar and enough water just to cover them, for around 5 minutes until they are pliable. Drain and set aside to cool. For the stuffing: In a large bowl, add the ground beef with the rice, the tomato, the pine nuts, the diced onions, the cumin and the parsley, seasoning to taste, and add half the olive oil (along with small quantities of water) as you knead the mixture until all the ingredients are well blended. The stuffing process: Lay out each onion layer and place about 1 tbsp of stuffing, or enough so that it has room to expand without tearing the onion, and roll up. Place in the saucepan with the seam down and repeat, placing all the stuffed onion petals next to each other and in layers if necessary. Add the rest of the olive oil and vinegar, and just enough water to cover the onions. Place a dinner plate upside down on top of the onions to keep them from moving around, cover the pot and cook over medium heat for around 25 minutes. Remove the lid and plate, check one onion to see if they’re done and cook for an additional 5 minutes to allow the sauce to thicken. They can be served warm or at room temperature.